Chaggai (Haggai the Prophet), One born on a Feast Day. The fate of the Ark of the Covenant has been a burning question pondering Bible scholars, theologians, biblical historians and archeologists since the exile of the Jewish people to Babylon in 586 BCE. The most prominent of these is Vendyl Jones and his search for the Qalal and the Sanctuary of the Congregation with its valued treasures including the Ark of the Covenant with its two golden cherubim. The Qalal which held the ashes of the red heifer in the Valley of Achor near the tomb of Moses (Moshe) not far from Mount Nebo. These were hidden because fate of the Temple of Solomon (Beit HaMikdash) was being threatened by the forces of Nebuchadnezzar, which many felt was built on the Temple Mount (Haram As-Sharif) in present-day Old Jerusalem. Over a century ago, Rabbi Rachnael Steinberg and Rabbi Mendel Tropper rediscovered the writings called the Emeq HaMelekh (Valley of the Kings) written by Rabbi Naftali Hertz in which several mishnahs were recorded by five temple guardians who hid the treasures of Solomon’s temple. Later, it was Solomon Schechter who discovered the ancient Talmud Tosefta, called the Massakhet Keilim in an ancient Genizah at the Old Cairo Ben Ezra Synagogue. Included in this discovery was an ancient scroll called the Temple Scroll that was purchased by Yigael Yadin. It was found in a cave by Mohammed Dieb near the Essene community of Qumran by the Dead Sea. Plus, two large engraved marble tablets found at Mount Carmel, that depicted the hiding of a vast hoard of temple furnishings and artifacts about ten years before the first invasion of Nebuchadnezzar. The Jewish Underground Commandos from the Temple of Solomon were sent on a rescue mission to hide all the temple furniture, the altars and the golden curtains that were a part of the priestly ministry in the Tabernacle of the Dwelling. Baruch son of Neriah, the scribe of Jeremiah. the nine red heifers for the Ashes to purify the temple. 2 – “And how that the prophet, having given them the law, charged them not to forget the commandments of the Lord, and that they should not err in their minds, when they see images of silver and gold, with their ornaments. 3 – “And with other such speeches exhorted he them, that the law would not depart from their hearts. 4 - “It was also contained in the same writing, that the prophet, being warned of G-d, commanded the tabernacle and the ark to go with him, as he went forth into the mountain, where Moses climbed up, and saw the heritage of G-d.
5 – “And when Jeremy came thither, he found a hollow cave, wherein he laid the tabernacle, and the ark, and the altar of incense, and so stopped the door. 6 – “And some of those that followed him came to mark the way, but they could not find it. 7 – “Which, when Jeremy perceived, he blamed them, saying, As for that place, it shall be unknown until the time that G-d gathers His people again together, and receive them unto mercy. Let us analyze this text briefly. It is one position of BibleSearchers to analyze any ancient document with the same respect we would give to modern historical documents. As a historian, one should look carefully at the historical context, the purpose and goal of the author and with an acceptance that the author had possible access of documents more contemporaneous with his era than has survived the ravages of time. Here the prophet Jeremiah speaks of taking the wilderness tabernacle, the Ark of the Covenant and the Altar of Incense and placing it in a hollow cave near Mount Nebo, the mount where Moses had his last vista of the Promised Land and visions of the future of God’s people. Deuteronomy 34:1-3 - “And Moses went up from the plains of Moav to the peak (Pisgah) of Mount Nebo, facing Jericho, and G-d showed him all the land of Gil’ad, to Dan, and all of the Naftali, and the land of Efrayim and Manashe, and all the land of Yehudah, as far as the sea, and the Negev, and the plain; the Valley of Jericho, city of palms, as far as Zo’ar”. Mount Nebo in the land of Moab, present day Jordan, has been identified with Jebel Nebah on the eastern shore and the northern end of the Dead Sea, five miles southwest of Heshbon. At about 2,643 feet in altitude and with its position overlooking the Jordan River, Nabo commands a view of all of western Palestine. Below are the plains of Moab where Balaam cast his curse upon the tents of Israel spread out before him. Holy Incense that was used on the Altar of Incense in the Most Holy Place of the Temple. Two places in the Maccabean passage it speaks of other documents, such as “found in the records” and “contained in the same writings”. What were these documents and what records were contained in them? This question has taunted the minds of scholars and students of Hebrew history for millenniums. It was a memorable year, 1947, when the modern State of Israel became the national homeland of the Jewish people. That same year, 1947, an Arab Bedouin with a well-placed rock in a cave opening in an area called Qumran, on the northeastern shore of the Dead Sea, heard the shattering of a crock of pottery and the religious and secular world ricocheted with a global reverberation as the Dead Sea Scrolls were discovered. "I do not know how the story got started that I was throwing rocks at my goats. My goats were grazing down there in the flat. I was sitting right up there on that ledge. I was bored and started throwing rocks against some big stones to see if I could break them. One rock glanced off of a stone and went into a small opening and I heard a strange thud and a cracking sound. Five years later, in 1952, in cave 3 (Qvj3) at Qumran, a new archeological find was unearthed by the workers under the dig supervision of Professor Gerald Harding, a seven-foot copper Scroll was discovered. Dubbed the “Copper Scroll”, it was kept in secret and the contents of this discovery were withheld from the public for four years. In this Copper Scroll, the ancient name of Qumran, Ir-Tzadok B’Succaca was recorded. Ancient maps of the Dead Sea area depict the modern Wadi Qumran or the Canyon of Qumran rather as the Wadi Succaca. The Adam Smith Bible Dictionary in the early 20th century identified Wadi Qumran as Wadi Succacah. The Yishiyim (Essenes) would have called their community by the ancient Aramaic name of Ir-Tzadok B’Succaca rather than the modern Arabic name of Qumran, meaning, ‘Two Moons”. The Copper Scroll was pressed from the purest of copper. From the back of the scroll and engraved in reverse script, the Hebrew letters when raised from the front and imprinted on a baked clay imprinted the script in legible Hebrew like the embossing of a printer’s ink pad on a sheet of paper. This scroll was taken to Manchester, England, the baked clay dissolved and the copper rolls cut to expose the archaic Hebrew writing on the corroded copper sheets. Most of the text in the Copper Scroll read like the inventory of a treasure with enigmatic descriptions of where they were buried including listings of geographical, topographical and geological features to help the one knowledgeable in the language and vocabulary of the rabbinic literature to find the treasures outlined in the scroll. When the transcription was first released with wide international publicity, it was also met with intense scholarly skepticism, many calling it a ‘hoax’, a ‘forgery’, ‘Jewish myth’, ‘works of a madman’. Most scholars, even to this day, feel that the Dead Sea Scrolls and the Copper Scroll are a repository of the Herodian temple library in Jerusalem and the contents of the Temple of the Lord that were secreted away prior to the destruction and ravaging by the Roman forces under Titus in 68-70 C.E. Yet the contents of the Copper Scroll depict a different picture. Here among the passages of the Copper Scroll was an inventory of the Holy Treasures that appeared to have been hidden by the Prophet Jeremiah and the Temple Guardians prior to the destruction of Solomon’s Temple by the Babylonians about 422 BCE according to Hebrew calendar time (538 BCE on the Gregorian calendar). Were the locations of these treasures never revealed and recovered for the services of Zerubbabel’s Temple by the Temple Guardians? If so, are they there today? Among the contents of the Copper Scroll was this passage. The Copper Scroll describes a hidden cave called the “Cave of the Column by the River of the Dome” and with these descriptions were given internal and external landmarks, layering levels and other descriptions that not only needed the proper interpretive codes to reveal their contents, but also a good knowledge of the history and rabbinic language used in that era. Was this Copper Scroll the “record” and the “same writing” as referenced in the II Maccabean passage? Jewish scholars still felt that there were more records to be found. The hunt continued, but it was not until 1992 when Rabbi Rachnael Steinberg with his student Rabbi Mendel Tropper discovered in Amsterdam, Holland the long-lost writings called the “Emeq HaMelekh”, meaning the Valley of the Kings, that had been written by Rabbi Naftali Hertz Ben Ya’acov Elchanon in the year 1648 in Amsterdam. According to rabbinic history, “Rav Hertz” was known as a prominent and holy Rabbi who excelled in the knowledge of the written and the oral Torah. His lineage of rabbinic knowledge came from the famed Rabbi Ari Ben Luria, leader of the rabbinic mystical sages which included the great Torah sage, Rabbi Yosef Cairo, author of the Shulchan Aruch. According to the records, Rabbi Naftali Hertz cited as his source the Massakhet Keilim, a Tosefta (addition) to the Talmud, which is not found in any modern Talmud today. According to the discoverer of the Emeq HaMelekh, Rabbi Steinberg, in the Talmud Huriot 12A, it describes the prophet Jeremiah, realizing that the destruction of Jerusalem and the Temple was imminent, organized a heroic rescue operation. ‘Chest’ sent by the Pelishtim (Philistines) to Israel as “a gift to the God of Israel”. Rabbi Tropper, also citing also the Babylonian Talmud in Tractate Yoma 72 A, stated that the Mishkhan (Wilderness Sanctuary) and all its contents were hidden away but will one day be found. Yes, here the Mishkhan, or Wilderness Temple, which was built by Bezaleel in the Negev Desert, under the supervision of Moses and the blueprint given to him by the L-rd of hosts on Mount Sinai, was kept in a sacred repository in a grotto under the Temple of Solomon and was still preserved in the days of Jeremiah and King Josiah. (4) – The numerous other vessels utilized for the detailed services of the Kohanim (priests). (6) The Tablets of the Ten Commandments brought down by Moses at Sinai. Because of these sacred contents and the level of holiness attained by the Prophet Moses, only the Mishkhan reached a pure enough state to warrant that the Shechina (Divine Presence of G-d) come to rest within it for all eternity. When the First Temple was built in Jerusalem, the Ark of the Covenant was placed inside while the rest of the Mishkhan was buried beneath in a secret vault." The story does not end. Later in the 1990’s, at Cambridge University was discovered work done by a Solomon Schechter in 1896, who had bought about 100,000 pages that had been discovered in a Genizah of the ancient and revered Ben Ezra Synagogue in Cairo, Egypt. ccording to the Torah, any document contained the name of the Holy One could not be destroyed, so when it was damaged or too old to be used, it was put in a document depository called a Genizah. The documents within the caves of Qumran were also suggested as being a Genizah depository for the Essenes or Herod’s Temple in Jerusalem. The reason being that Qumran was suggested as being a Genizah is that every book in the Torah, Writings and the Prophets, plus countless other intertestament writings and commentaries were represented in the Qumran library except the Book of Esther, the only book written by or about the Jews that does not give the name of G-d. Within the scrolls found in the Ben Ezra Synagogue’s Genizah in Cairo, Egypt was found a copy of the missing Tosefta, listed under the section of Keilim (‘Vessels’) and noted to be the same source writings that Rabbi Hertz was citing in his 1648 Mishnayots. The only difference, these source writings were believed to be from the 8th and 9th century, 800 years earlier. Rabbi Naftali (Ben Elchanan) Hertz, called these records Mishnayots and were included in the introduction of his text. The Mishnah as the rabbinic written documentation of the oral traditions passed down by the Levites from the time of Moses is the first section of the Talmud, which also includes ‘the summary’, called the Gemara. Chaggai the Prophet and Zechariah, son of Ido the Prophet. Let us quickly compose ourselves quickly with the implication of the introduction to these Mishnahs. Four of the names are easily recognizable; Hezekiah (Hizkiyah), Zedekiah (Zidkiyah), Haggai (Chaggai the prophet) and Zechariah the Prophet, son of Berachiah (Mishanah 2), son of Ido. Other names found within these Mishnahs include: Shimur HaLevi (the Levite), Ezra the Cohen (priest) the scribe, Hilkiyah the Scribe (Mishnah 7), Beruch ben (son of) Neriah with Zidkiyah (Mishnah 9 and 10), and Hiluk, the son of Shimur HaLevi (Mishnah 12). The Merarites were the family that was in charge of the singing in the House of the Lord by King David, after the Ark was moved to Jerusalem. (1 Chron. 6:32). Yet this Shimur HaLevi was soon recognized as the leader of a quintet of Jewish Revolutionaries: Shimur the Levite, Hizkiyah, Zidkiyah, Chaggai the Prophet and Zechariah son of Ido the Prophet. They were intent on fulfilling the commands of the L-rd given to Jeremiah the Prophet to hide and secrete the treasures of the Wilderness Tabernacle and a large part of the treasures of Solomon’s Temple away before the military forces of Nebuchadnezzar could take custody of them to Babylon. Latter writings engraved on two white marble tablets, which included the names and date of the Solomon’s temple commando, which accepted documents antedate the Essene community at the time of the Temple of Herod era in the 1st century BC to CE by five centuries. They stand as a class of writing by themselves. 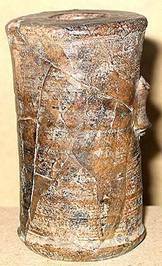 The Temple Scroll, called the Ibex Skin Scroll was found at Qumran in 1950 in Cave 11, by the same Bedouin, Mohammed Dieb, who found the Dead Sea Scrolls in 1947 less than 25 meters away. This scroll was also documented as being written by Shimur HaLevi in the Year 431 BCE. An extensive document, which multi-volumes have been written by the Dead Sea Scroll scholars, it was initially purchased by Yigael Yadin for the Nation of Israel at the end of the 1967 Six Day War and published in 1983. Professor Yadin was fascinated by the wording of the author, who wrote the script in the First Person, suggested by some authorities that it was a dictated script given by the Lord of hosts to Moses on Mount Sinai. In the Ibex Skin “Temple Scroll” Scroll, was recorded a detailed account of how to re-institute the Temple services and the rituals. The descriptions of these furnishings described are felt by many scholars to be a description on how to put these buried treasures to use in the service of the G-d of Jacob in a future third temple. Included in the Temple Scroll are accounts of the ancient Hebrew festivals which were celebrated by the Essenes, but also instructions of the animal sacrifices that were not celebrated by the Essenes. As such, this document is not accepted by some scholars as a true Essene document, but a treasured document which was a part of their extensive library. Shimur HaLevi, along with being credited as a co-author of the Copper Scroll from Qumran and author of the Ibex Skin “Temple” Scroll, a third document attributed to Shimur HaLevi that was discovered in the archeological digs of Israel are two immense Marble Tablets. Its whereabouts were unknown so began hunt and eventual discovery of these two large Marble Slabs, originally on Mount Carmel of the Prophet Elijah fame. Soon the archeological hunt continued to the basement of a museum in Beirut, Lebanon, when two large Marble Tablets, found initially at Mount Carmel, were now discovered in the summer of 1952 museum renovations. (Implications of the discovery were not recognized until years later). “These are the words of Shimur HaLevi, the servant of HaShem. In the year 3331 of Adam”. Yet this same Shimon HaLevi still seems to warrant a distinction of why he is not recorded in scripture. We have one more clue; we shall soon see in the Mishnah 5 in the Tractate Parah, it lists the number of red heifers that were sacrificed since the time of Moses. After noting that one of the red heifers was burned by Ezra the Levite, then it records that and additional two red heifers were burned by Shimon Ha Tzaddik. Shimon the Levite had now become Shimon the Righteous One or Zaddik. Zedekiah (Zidkiyah) is a name meaning ‘Yahweh is righteousness’. This sounds familiar, as we identify it with the name of the last king of Judah, King Zedekiah, who reigned from 597-586 BCE. His original name was Mattaniah, but was changed to Zedekiah by King Nebuchadnezzar, when he appointed him king instead of his nephew, Jehoiachin (2 Ki 24:17; 1 Chr 3:15). He was a morally weak and vacillating king, who at times appeared to side with the prophet Jeremiah, who was his grand-father, who also was pro-Babylonian. He even went to visit Babylon in the 4th regnal year, in what some historians suggest was for the great festival of Nebuchadnezzar in which he erected his golden statue in the Plain of Dur as recorded in Daniel 3; the era of Daniel and the three worthies; Daniel, Hananiah, Mishael, and Azariah, who were thrown in the fiery furnace during that event. King Zedekiah later upon returning to Jerusalem succumbed to the pressure of the anti-Babylonians and the pro-Egyptians and rebelled against Babylon. This resulted in the 3rd capture in 20 years and final destruction of Jerusalem after a long and appalling siege between 10th day of the 10th month in the 9th regnal year (January 15, 588 BCE) and the 9th day of the 4th month in the 11th regnal year or Nebuchadnezzar’s 19th year (July 19, 586 BCE.). There was also another Zidkiyah who was a prominent leader noted in the assembly brought together by Nehemiah, the governor of Judah, who with Ezra the Cohen and scribe set out a series of religious reforms (Nehemiah 8) which culminated in the reading of the Torah and the teachings contained within it. Governor Nehemiah then convened a great assembly to sign a covenant of reform. This included the prominent civil leaders, the cohenim (priests) and Levites and all the people of Jerusalem. Zidkiyah was the first of the civil and political leaders to set his seal to Nehemiah’s covenant of reform. As such he was designated as the 1st representative of the people after the governor, Nehemiah. (Neh 10:1) Was this the Zidkiyah of the Emeq HaMelekh? Haggai (Chaggai) the prophet, meaning ‘one born on a feast day’, became one of the most potent prophetic voices to the newly return exiles from Babylon to Judea. In his five messages recorded in the Book of Haggai, he encouraged the people that they were in active cooperation with the Lord of hosts and that their faithful service would be richly rewarded by their G-d. It appears that he was a senior citizen in Judea, a revered grandfather of the returned exiled Jews. What they may not have known, Haggai was one of the guardians of the treasures in the Old Temple of Solomon (Haggai 2:3) when he challenged his contemporaries, “Is there anyone among you who saw this house in its former glory? You can almost hear him say the obvious, “I did”. As we shall soon see, he was one of the guardians of the Temple Treasures, a memory that was sealed within his memory to his death. While the people mourned that the new temple did not have the glory of Solomon’s (Sholomo’s) temple, the whereabouts of the treasures that could have increased the glory of this Temple was known, but the Lord of hosts would not allow it to be revealed until a future and more glorious temple in the future of history of the Jews. Why did he not reveal were the hiding places for these hidden treasures to the leadership of Judea so they would eventually be restored into the house of the Lord in Jerusalem? Zechariah, the Prophet, the son of Iddo’s life has been accounted for in the Oracles of Zechariah, a commentary on the Book of Zechariah. What we now know as the “rest of the story”, Zechariah was not only a contemporary of the prophet Haggai, the renown civil leader Zidkiyah, Hezekiah, and Shimur, the Levite, a possible member of the temple chorus were all accomplices in the secret and delicate espionage of hiding the treasures of the Temple of Solomon not only in the land of Judea but also in the city of Babylon and also near the city of Baghdad. Wait a minute, the capital of Iraq of Saddam Hussein was the purported site of the repository of hidden treasures from the era of Solomon’s temple? Yes, this is the implication of this document that has been preserved in the archives of the Jews for centuries. Not only that, it was the intent of the five Guardians that the wealth of these treasures would remain concealed until ‘the day of the coming of Maschiach, son of David. It was their hope that the coming of the Maschiach ben David would have been ‘speedily in our times’, but as we now know, they carried their secret to their grave except for the legacy recorded on these Mishnayots, there was another record. This team working in concert with each other, they inscribed the inventory of these ‘holy vessels and the vessels of the Temple that were in Jerusalem’ on a “Luach Nehoshet” or a Copper plate or sheet, hoping it would be preserved until the end of times and prior to the coming of the Messiah (Maschiach). Shimur HaLevi engraved in bas relief on two immense marble tablets the same mishnayots for the sake of preservation of the record.